Find your perfect pair with the Kitchen Combination, featuring one of our favourite faucets matched with a best-selling sink. The Nola Pull-Down Faucet features an ergonomic dual-function sprayhead and top-quality components for maximum durability. The KHF200 30" Farmhouse Apron Sink is made with premium 16G T-304 stainless steel, and fully soundproofed with NoiseDefend technology. This combo comes with a matching soap dispenser. Experience Kraus Quality, and outfit your kitchen in style. 30 Inch. Apron Front Single Bowl SS Sink W/ Pull Down Faucet & SD Chrome Find your perfect pair with the Kitchen Combination, featuring one of our favourite faucets matched with a best-selling sink. The Nola Pull-Down Faucet features an ergonomic dual-function sprayhead and top-quality components for maximum durability. The KHF200 30" Farmhouse Apron Sink is made with premium 16G T-304 stainless steel, and fully soundproofed with NoiseDefend technology. This combo comes with a matching soap dispenser. Experience Kraus Quality, and outfit your kitchen in style. 30 Inch. 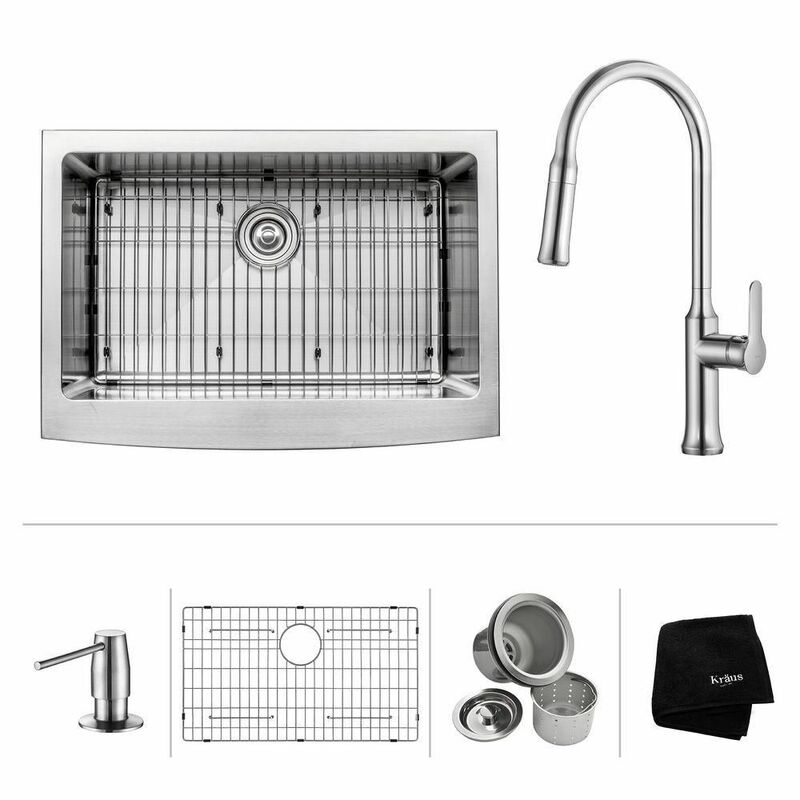 Apron Front Single Bowl SS Sink W/ Pull Down Faucet & SD Chrome is rated 5.0 out of 5 by 1. Rated 5 out of 5 by Sink from Nice sink. ... Nice sink.